On the various egroup forums we share ideas with each other utilizing the group mind to penetrate further into the mysteries of cosmology and using the writings of DK and others as both a springboard for our speculations and also as a yardstick by which to measure and test them by. We attempt to educate ourselves and each other on the teachings and expand upon the edges of them. We understand that inspiration is a part of this process and that there is an alchemical reaction between the teachings as an outer repository of wisdom, our innate soul wisdom, and the capacity we have to reach into higher spheres directly. For the purposes of clarity we make distinctions between quotes from DK and our own speculations and impressions. We are also informed in the teachings that there is a third phase to run, which will be revealed this century and so we attempt to fully understand and assimilate what has been given to be ready for it. For example we are told that that immense volume – A Treatise on Cosmic Fire – will serve students until 2025. When someone purports to be receiving transmissions of new information (as I have done myself) we are naturally cautious and want to compare the quality of that which is received with the immense contribution DK has offered to date. We would rightfully want to be cautious in accepting anything new – when what has been given has not been fully assimilated and is seen to be of a greater quality. We would want to avoid the glamours of “new presentations” and at the same time avoid the glamours of adherence to the old. This was the situation that many members of the Theosophical Society found themselves in when the Bailey material was presented. The ‘Back to Blavatsky’ types would say that all subsequent material (including Bailey) was derivative and appealed to those unable and undisciplined enough to really get into the Secret Doctrine. Others would have been upset that her claims of relationship to the Masters would upset the political structure of the Society. Over time as groups responded to the new note, assimilated it with the existing teachings and tested out the value in service, then a bridge is formed. Within all esoteric groups there are those who are attached to the form of the teachings they work with, and those resonant to the spirit or life behind the form. We are now at an intermediate phase between the second phase of the teachings and the third. We are applying what has been given and simultaneously reaching towards that which will soon be precipitating. How are we best to negotiate this transition? Those who are astrally polarized will ever go with their emotional interests and with allegiance to personalities – of teachers and teachings, but it is those whose minds are alive and responsive to the living currents of Hierarchy that will have to make the necessary discriminations between different expressions and levels of teachings within an overall field of synthesis. Individuals are at many different levels and have different ray affiliations and therefore all teaching that has at least some current from higher sources will find its place. Further, the seventh ray age will have as its emphasis the inflow of Hierarchical energies – ‘the waves of sound and colour break upon the shores’. Everywhere people will be asserting their relationship with sources of inspiration and so how are we to discriminate? I think we can take a leaf from the book of the fifth ray scientific ashram (and is not esoteric psychology the higher expression of the fifth ray?). New information is bought to a group of peers in the scientific community for assessment. Further, it is tested through experimentation and then those experiments are performed by others to see if they get the same results. Eventually what begins as hypothesis and speculation becomes accepted fact with a spectrum of ideas between fringe and mainstream science. Part of the difficulty in the esoteric sciences comes from the very thing that they have to offer – the assertion of higher sources of intelligence. In exoteric science it might be assumed that there is such a thing as the ‘Mind of God’ but it is not normally accepted that this Mind works through different levels of disincarnate entities that step it down into human consciousness. Mention of contact with these intermediaries causes several types of problem. Such were the problems that Blavatsky even mentioned on one occasion that she was sorry she even mentioned the Masters at all, or something to that effect. In India they still have a clear discrimination between texts that are the parts of the Vedas that are the ‘revealed word of God’, and the interpreted ‘word of God’. Much of the religious conflict in the world comes back to point three above and indeed most of these problems are caused by astrality and concrete mind, while abstract mind by definition is able to deal with ideas without being overly concerned with their source. Not mentioning the higher sources of inspiration can also have its problems – witness the paper wall Assagioli set up between the Masters and the psychosynthesis work. Many of those groups had major power issues to deal with because the power behind the teachings is not allocated a higher origin and is more likely to be confused with the personalities of the teachers themselves. One of the principles of science is that you quote your sources. This allows others coming in contact with your ideas to trace the stream of thought back to its origin. Those that have no prior source are deemed to be ‘original’ and therefore somehow derived out of the mind of the thinker. With esotericism this ‘quoting of sources’ becomes more problematic. When the sources are claimed to be ‘Masters’ one cannot go to a library and look them up to confirm the claim. One must be capable of verifying that directly through access to the inner library. Keeping quiet about one’s sources also has problems in exoteric and esoteric science. We are told to discriminate between the self and the not-self and to distinguish between currents originating within one’s own personality, from the soul, from the ashram, and from the Master. How do we assess this correctly and do we openly reveal our perceptions of the various sources? I would suggest we develop the capacity through experimentation – trial and error. One way penetrates. The other way opens. One takes the kingdom of heaven by storm with the abstract mind, the other allows heaven to enter into the abstract mind and plant a thought essence. One is the sword the other the chalice. The adventuring intuitive explores the unknown – he leaves his home (causal body) and goes to the heights – goes into uncharted territory and brings back strange new creatures of thought and scribbled maps of unseen lands. The receptive intuitive stays at home and allows the adventure to come to her – she makes of herself a chalice into which the wonders of the heights are poured. Overflowing through her into her immediate surroundings. We might say the first way is masculine and the second feminine, which is probably why so many of the inspired higher mediums have been women – AAB, HPB, HR, to name just those in this tradition. And so many of the inspired ‘adventurers’ have been men – Einstein, Hawkings, and so on. When one is used to one approach or the other, the opposite can appear like an anathema. To a strong willed mind, the idea of opening to another’s thoughts no matter how inspired can be difficult. To a receptively inclined mind, the idea of gathering ones mental energy together to form a honed blade of penetration can also be difficult. I would like to offer some insights into this dual process from my own experience. The first polarity is to me an expression of Agni Yoga (see the Technique of the A Presence in Glamour: A World Problem). I used it to write my book on Agni and to a lesser extent when I study the teachings and try to speculate on them. It involves making ‘demand’ upon the “raincloud of knowable things” and can be summed up as follows. Preliminaries: Become aware of and identify with Humanity’s desire to reach Hierarchy. Choose a particular area that demands revelation upon which to focus. Equip the mind with as much known information as possible. Brood upon it. Enter or find oneself in more or less permanent meditation as a result of the brooding and align with higher sources of being. Focus the soul/mind on the question until the intensity of a ‘demand’ is reached. This requires a conscious act of the will. Releasing identification with the causal field and ascending on the power of the demand – penetrating into higher levels of energy and purpose. Returning to the causal field and converting the fire contacted into abstract thoughts and writing them down. Acting on what is received – following through and releasing the energy creatively into the three worlds. In his commentary on the Technique DK calls souls who penetrate the heights ‘adventuring intuitives’ or ‘intruding agents of light. There is no doubt that what is learned from these excursions, even though they concern revelation from higher sources, is generated by the inquiring disciple. The revelation is ‘appropriated’ and therefore rightly ‘belongs’ to the appropriating consciousness in a sense. Preliminaries. Become aware of and identify with Hierarchy’s will to reach Humanity. Offering ones equipment for that purpose. Reaching a stage of meditation that is soul-centred and making contact with higher sources of inspiration – be it another disciple, Master, or Nirmanakaya. Emptying the mind and offering it up as a receptacle to be worked through by the higher entity. This is a conscious process and requires an act of willful surrender. Opening the consciousness to the descent of energetic impression. Formulating the idea essences into abstract thoughts and writing them down. Acting on what is received – following through and releasing the energy creatively in the three worlds. In this process it seems entirely inappropriate to put forward the thoughts as one’s own because the consciousness initiating the process is clearly experienced as being external to one’s own identity. These two processes to me form the supply and demand equation that governs the circulation of the currency of ideas between Hierarchy and Humanity. They are an expression of the Science of Impression – invocation and evocation. The chart below gives some visual impression of these two approaches. In my experience the two methods, which are really one, have different energetic effects on the consciousness of those engaged in the process as well as those receiving any fruits of the endeavour. In the case of penetration, the consciousness is ‘enfired’ . It is stimulated by contact with electric fire and is burning. The effect is ‘lightning’. In the case of reception the consciousness is ‘moistened’ and opened. It has received the rains of solar fire from heaven and these are soaking into the earth. The effect is ‘grace’. There is also a difference in the way these processes operate with respect to time. My experience with being caught up in the ‘penetrative experience’ – like lightning it strikes when it will. The consciousness is called to the heights – it is evoked – one is ‘caught up into the seventh heaven’ – when the call comes then it matters little what is going on in the three worlds – the call assumes priority to all else and one finds oneself up in the middle of the night, unable to focus on anything else until the key drops in. The receptive experience however responds very well to rhythm. A certain time is set aside each day or week and at that time a conscious decision must be made to put aside all lesser priorities and be open to receive. One moment before the reception starts the consciousness can have been on very mundane things but the next it is flooded with the sublime. In the first case one struggles to stay connected or ‘grounded’ with outer priorities. In the second case one must make a conscious choice to put them aside. I would be interested to hear other people’s experience of these differing types of experience. Because the experience of these two ‘modes’ of receiving information is quite different then the way they are presented is also likely to be different. Perhaps there is another way of presenting ideas that transcends the issues of source and ‘ownership’ – “Here is an idea – what do you think of it?” The source of the idea is not important but the idea itself assumes centre stage. Is it valuable? Does it build on what is already known in a coherent way? Is it useful? Does it really matter where it came from? Revealed wisdom is revealed no matter what framework is put around it concerning its source. “I am putting forward this idea as a received impression”. In neither statement is one saying, “This is the Truth”, although impressions are generally conveyed in word forms that are more authorative sounding. The next step is to leave the idea to time and the wider group process to see if it is assimilated or rejected within the field of human consciousness. In my view we are moving towards an inner marriage of the two approaches for receiving information resulting in something quite new and flexible – a consciousness able to move in both directions at once. For this we could give the symbol – the flame above the chalice. The triadal flame is capable of being a conduit in two directions – it can take the consciousness of the disciple to the heights and can bring the consciousness of the heights into the chalice of the causal body. The antahkarana is built and can be utilized as a channel in both directions – the in-breath and the out-breath. These ‘breathings’ are linked to the idea of ray cycles and occur within the day, the month, the year, the century and so forth of time and space. On the in-breath the consciousness of mankind is being called to the heights. On the out-breath the energies of the subtle realms are impinging on the shores of human consciousness. The seventh ray is that which brings the heights to the depths and in the seventh ray age we are seeing the balancing energy to the upwards call of the sixth ray. Just as in the outer world we are seeing at the cusp of the age the restoration of the sacred principle of the feminine – the capacity for matter to act as a vehicle of reception to spirit and the recognition that spirit and matter are equally divine – we are also opening to using our consciousness in the more feminine, receptive way while retaining the best of the other approach. The Masters need vehicles of reception. They seek to turn disciples around and have them serve the Plan for Externalisation. To be admitted to the privilege of being an outpost of His consciousness requires an unselfishness and a self-surrender for which few are prepared; to be drawn within His aura so that the disciple’s aura forms an integral part of the group aura presupposes a purity which few can cultivate; to have the ear of the Master and to earn the right to contact Him at will necessitates a sensitiveness and a fine discrimination which few would care to purchase at the price. Yet a door stands wide open to all who care to come, and no earnest, sincere soul, who meets the requirements, ever receives a rebuff. I have included the quotes from the Tibetan about inspired writings in full at the end of this paper for those interested, but for now I just want to point out the need Hierarchy has for scientifically trained receivers of impression. In my own experience it is easier to admit the idea of penetrating in to revelatory wisdom than it is to open to the idea of being used as a transmitter. There is a bias in our cuspal culture as well as in the mental field. I am a trained scientist – what have I do to with ‘channels’? Surely there is something ‘weak’ about being receptive and promulgating the ideas of others? Surely ‘channeling’ applies to the astral body and to disenfranchised housewives who want to feel special and write letters out of their own wish life purporting to be from the Masters in flowing purple script beginning, “My Dear Beloved Ones…:). Receptivity can be allied in our minds with passivity and mediumship, and yet true mental receptivity requires an act of willful surrender and is not passive at all. With so much information beginning to pour into the world of various different levels of quality it would seem to make sense that those who have developed the mind, who have trained themselves through meditation, who have assimilated and unfolded much of the current phase of the teachings, and who have a resonance to the ashram of the Master DK, might be well utilized if they were willing to genuinely offer themselves as a potential vehicle of transmission. It does require a certain overcoming of mental pride however, a willingness to experiment and a willingness to ‘not know’ rather than to know, at least for the duration of the experiment. One part of the necessary training is necessarily subjective and goes on between the disciple and the Master – another part comes from testing out what is received within the outer group field and service work. Together, the inner and outer connections provide a crucible where the consciousness learns to discriminate and refine the antahkarana so that it is able to serve with less and less personal colouration. Which brings me back to the role of groups such as this and their capacity to serve as scientific training grounds for testing new ideas as we move between the second phase of the teachings and the third. By becoming more conscious of and being more willing to reveal our different ways of working and our different ‘sources’, we can help train each other. Contacting the Masters does not have to be a descent into glamour and illusion but can be a way of freeing ourselves to be able to discriminate more and combine the striving and surrender into the straight knowing of the intuition. We can keep our respect and honour for the great body of work that has been given and at the same time extend our attention more fully to the source, knowing that it is a living font from which new forms will spring. In any event, it is obvious when the group mind begins to come under impression and deeper levels of understanding are revealed. Through experimentation and the willingness to serve both Hierarchy and Humanity we may refine our equipment and hone our capacity to act as intermediaries and interpreters. Nothing can be lost in the attempt to open ourselves individually and in group formation to be better receivers of the Life and to help clothe that Life in thoughts and outer initiatives which will find their appropriate level of contribution to the world. Such are some of the teachings concerning disciples and their recognitions and it is valuable for aspirants to ponder them. It should be realised that though good character, high ethics, sound morality and spiritual aspiration are basic and unalterable requirements, yet more is needed if the right to enter the Master’s Ashram is to be granted. There is no question at this time that those who are in any way advanced in evolution are having that evolution hastened as never before in the history of the world. The crisis is so grave and the need of the world so great, that those who can contact the inner side of life, who can even in a small way sense the vibrations of the senior disciples and the Elder Brothers of the race, and who can bring down the ideals, as known on the higher planes, are being very carefully, forcefully, yet strenuously trained. It is necessary that they should be enabled to act accurately and adequately as transmitters and interpreters. I would like to point out certain factors and methods [Page 175] which should be borne in mind in connection with inspirational writing and mediumship, and which have a bearing on the writing of such books as The Secret Doctrine, the Scriptures of the world and those transmitted volumes which potently affect the thought of the race. The interpretation of the process arises from many causes; the status of the writers can be overestimated or not sufficiently appreciated; the terms used by the transmitter being dependent upon his educational status may also be incorrect or give rise to misinterpretation. It is necessary, therefore, that some understanding of the process should be found. Some transmitters work entirely on astral levels and their work is necessarily part of the great illusion. They are unconscious mediums and are unable to check the source from whence the teachings come; if they claim to know that source, they are frequently in error. Some receive teaching from discarnate entities of no higher evolution, and frequently of lower, than themselves. Some are simply abstracting the content of their own subconsciousnesses, and hence we have the beautiful platitudes, couched in Christian phraseology, and tinctured by the mystical writings of the past, which litter the desks of disciples, working consciously on the physical plane. Some work only on mental levels, learning, through telepathy, that which the Elder Brothers of the race and their own souls have to impart. They tap the sources of knowledge stored in the egoic consciousness. They become aware of the knowledge stored up in the brains of disciples on the same ray as themselves. Some of them, being outposts of the Master’s consciousness, become also cognizant of His thought. Some use several of the methods, either consciously or unconsciously. When they work consciously, it is then possible for them to correlate the teaching given and, under the Law of Correspondences [Page 176] and through the use of symbols (which they see through mental clairvoyance), to ascertain the accuracy of their teaching. Those who work unconsciously (I refer not to astral psychics), can use only trust and discrimination until they are further evolved. They must accept nothing that contradicts facts imparted through the Lodge’s great Messengers, and they must be ready to superimpose upon the modicum of knowledge which they possess a further structure of greater extent. Each generation now should produce its seers. I like the word spelt “see-ers”, for to see is to know. The fault of all of you is that you see not; you perceive an angle, a point of vision, a partial aspect of the great fabric of truth, but all that lies hidden behind is occult to your three dimensional vision. It is necessary for those who want to act as true transmitters and intermediaries between the Knowers of the race and the “little ones” that they keep their eyes on the horizon and seek thus to extend their vision; that they hold steadily the inner realization that they already have and seek to increase its scope; that they hold on to the truth that all things are headed towards the revelation, and that the form matters not. They must seek pre-eminently to be dependable instruments, unswayed by passing storms. They must endeavor to remain free from depression, no matter what occurs; liberated from discouragement; with a keen sense of proportion; a right judgment in all things; a regulated life; a disciplined physical body and a whole-hearted devotion to humanity. Where these qualities are present, the Masters can begin to use Their destined workers; where they are absent, other instruments must be found. Some people learn at night and regularly bring over into their physical brain consciousness the facts they need to know and the teachings they should transmit. Many methods are tried, suited to the nature of the aspirant [Page 177] or chela. Some have brains that act telepathically as transmitters. I deal with safer and rarer methods which utilize the mental vehicle as the intermediary between the soul and the brain, or between the teacher and the disciple. Methods of communication on the astral level, such as the ouija board, the planchette pencil, automatic writing, the direct voice and statements made by the temporarily obsessed medium are not utilized as a rule by chelas, though the direct voice has had its use at times. The higher mental methods are more advanced and surer-even if rarer. 1. They write from personal knowledge, and therefore employ their concrete minds at the task of stating this knowledge in terms that will reveal the truth to those that have the eyes to see, and yet will conceal that which is dangerous from the curious and the blind. This is a hard task to accomplish, for the concrete mind expresses the abstract most inadequately and, in the task of embodying the truth in words, much of the true significance is lost. 2. They write because they are inspired. Because of their physical equipment, their purity of life, their singleness of purpose, their devotion to humanity and the very karma of service itself, they have developed the capacity to touch the higher sources from which pure truth, or symbolic truth, flows. They can tap thought currents that have been set in motion by that great band of Contemplators, called Nirmanakayas, or those definite, specialized thought currents originated by one of the great staff of teachers. Their brains, being receptive transmitters, enable them to express these contacted thoughts on paper-the accuracy of the transmission being dependent upon the receptivity of the instrument (that is, the mind and the brain) of the transmitter. In these cases, the form of words and the sentences are largely left to the writer. Therefore, the appropriateness of the terms used and the correctness of the phraseology will depend upon his mental equipment, his educational advantages, the extent of his vocabulary and his inherent capacity to understand the nature and quality of the imparted thought and ideas. 3. They write because of the development of the inner hearing. Their work is largely stenographic, yet is also partially dependent upon their standard of development and their education. A certain definite unfoldment of the centres, coupled with karmic availability, constitutes the basis of choice by the teacher on the subtler planes who seeks to impart a definite instruction and a specialized line of thought. The responsibility as to accuracy is therefore divided between the one who imparts the teaching and the transmitting agent. The physical plane agent must be carefully chosen and the accuracy of the imparted information, as expressed on the physical plane, will depend upon his willingness to be used, his positive mental polarization, and his freedom from astralism. To this must be added the fact that the better educated a man may be, the wider his range of knowledge and scope of world interests, the easier it will be for the teacher on the inner side to render, through his agency, the knowledge to be imparted. Frequently the dictated data may be entirely foreign to the receiver. He must have a certain amount, therefore, of education, and be himself a profound seeker of truth before he will be chosen to be the recipient of teachings that are intended for the general public or for esoteric use. Above everything else, he must have learnt through meditation to focus himself on the mental plane. 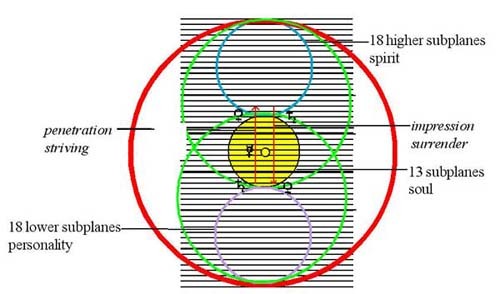 Similarity of vibration and of interests hold the clue to the choice of a transmitter. Note that I say; similarity of vibration and of interests and not equality of vibration and of interests. This form of work might be divided into three methods: There is first the higher clairaudience that speaks directly from mind to mind. This is not exactly telepathy but a form of direct hearing. The teacher will speak to the disciple as person to person. A conversation is therefore carried on entirely on mental levels with the higher faculties as the focusing point. The use of the head centres is involved and they must both be vivified before this method can be employed. In the astral body the centres corresponding to the physical have to be awakened before astral psychism is possible. The work that I refer to here involves a corresponding vivification in the mental body counterparts. a. Direct from Master to pupil; from disciple to disciple; from student to student. b. From Master or disciple to the ego and thence to the personality, via the atomic sub-planes. You will note therefore that only those in whose bodies atomic sub-plane matter is found can work this way. Safety and accuracy lie in this equipment. c. From ego to ego via the causal body and transmitted direct according to the preceding method or stored up to work through gradually and at need. Thirdly, we have inspiration. This involves another aspect of development. Inspiration is analogous to mediumship, but is entirely egoic. It utilizes the mind as the medium of transmission to the brain of that which the soul knows. Mediumship usually describes the process when confined entirely to the astral levels. On the egoic plane this involves inspiration. Ponder on this explanation for it explains much. Mediumship is dangerous. [Page 180] Why is this so? Because the mental body is not involved and so the soul is not in control. The medium is an unconscious instrument, he is not himself the controlling factor; he is controlled. Frequently also the discarnate entities who employ this method of communication, utilizing the brain or voice apparatus of the medium, are not highly evolved, and are quite incapable of employing mental plane methods. Some people combine the method of inspiration and of receiving instruction along various lines and, when this is the case, great accuracy of transmission is found. Occasionally again, as in the case of H. P. B. you have deep knowledge, ability to be inspired and mental clairaudience combined. When this is the case you have a rare and useful instrument for the aiding of humanity. a. He may use the brain of the appointed channel, throwing thoughts into it. b. He may occupy his disciple’s body, the latter standing aside, consciously, in his subtler bodies, but surrendering his physical body. c. A third method is one of a temporary fusing, if I might so call it,-an intermingling when the user and the used alternate or supplement, as needed, to do the appointed work. I cannot explain more clearly. 4. They write what they see. This method is not of such a high order. You will note that in the first case [Page 181] you have wisdom or availability on buddhic or intuitional levels; in the second case you have transmission from the causal body, from the higher mental levels; in the third case you have sufficient development to enable the aspirant to receive dictation. In the fourth case, you have the ability to read in the astral light but frequently no ability to differentiate between that which is past, that which is, and that which will be. Therefore you have illusion and inaccuracy. This is a method, however, sometimes used but-unless directly used under stimulation applied by a Master-it is liable to be most misleading, as is its corollary, astral clairaudience. It is the method of mental clairvoyance, and requires a trained interpreting mind, which is rare indeed to find. In all these cases that I have cited error may creep in owing to physical limitation and the handicap of words, but in the case of those who write from personal knowledge the errors in expression will be of no real moment; whilst in the second and third cases the errors will be dependent upon the point in evolution of the transmitting agent. If, however, he couples intelligence, devotion and service, with his capacity to receive and hear, he will soon correct the errors himself and his understanding will grow. Later two new methods will be employed which will facilitate the transmission of truth from the inner side to the outer plane. Precipitated writing will be given to those who can be trusted, but the time is not yet for its general use. It will be necessary to wait until the work of the esoteric schools has reached a more definite phase of development. Conditions as yet are not appropriate, but humanity is urged to be ready and open-minded and prepared for this development. Later will come the power to materialize thought-forms. People will come into incarnation who will have the ability temporarily to create and vitalize these thought-forms, and [Page 182] so enable the general public to see them. The time, however, is not yet. There is too much fear, and not enough experience of truth in the world. More knowledge must be acquired as to the nature of thought and of matter, and this must be followed experimentally by those with acute trained minds, a high rate of vibration, and bodies built of the finest matter. The attainment of this will involve discipline, pain, self-abnegation and abstinence. See you to it. First. An impression upon the physical brain of the [Page 757] man or woman, of thoughts, plans for work, ideals and intentions which (emanating from the Avatar) will yet be unrecognised by him as being other than his own; he will proceed to put them into action, unconsciously helped by the force flowing in. This is literally a form of higher mental telepathy working out on physical levels. Second. The overshadowing of the chela during his work (such as lecturing, writing, or teaching), and his illumination for service. He will be conscious of this, though perhaps unable to explain it, and will seek more and more to be available for use, rendering himself up in utter selflessness to the inspiration of His Lord. This is effected via the chela’s Ego, the force flowing through his astral permanent atom; and it is only possible when the fifth petal is unfolded. Third. The conscious co-operation of the chela is necessitated in the third method of overshadowing. In this case he will (with full knowledge of the laws of his being and nature) surrender himself and step out of his physical body, handing it over for the use of the Great Lord or one of His Masters. This is only possible in the case of a chela who has brought all the three lower bodies into alignment, and necessitates the unfolding of the sixth petal. By an act of conscious will he renders up his body, and stands aside for a specific length of time. This Way is revealed to the disciple, e’en though it may not concern the intuitive message which he may bring back from his high adventure. a. There will suddenly dawn upon the disciple’s waiting mind (which still remains the agent of reception) the answer to his problem, the clue to what is needed to bring relief to humanity, the information desired which, when applied, will unlock some door in the realm of science, psychology or religion. This door, when opened, will bring relief or release to many. As before I have told you, the intuition is never concerned [Page 182] with individual problems or enquiries, as so many self-centred aspirants think. It is purely impersonal and only applicable to humanity in a synthetic sense. b. The “intruding agent of light” (as the Old Commentary calls these adventuring intuitives) is recognised as one to whom can be entrusted some revelation, some new impartation of truth, some significant expansion from a seed of truth already given to the race. He then sees a vision, hears a voice, registers a message, or-highest form of all-he becomes a channel of power and light to the world, a conscious Embodiment of divinity, or a Custodian of a divine principle. These forms constitute true revelation, imparted or embodied; they are still rare but will increasingly be developed in humanity. This basic technique underlies both primary and secondary revelations. In the case of the first, the time cycle is long; in the second, the time cycle is short. A very good instance of this process is demonstrated by one of the secondary points of revelation in connection with the teaching which emanated from the Hierarchy (the Custodian of secondary revelations, as Shamballa is of primary) fifty years ago and which took the form of The Secret Doctrine. H.P.B. was the “penetrating, sensing, appropriating intuitive.” The revelation she conveyed followed the accustomed routine of all secondary revelation from the Source to the outer plane. There the minds of men, veiled by illusion and clouded by glamour, formulated it into an inelastic doctrine, recognising no further revelation and holding steadily-many of the theosophical groups-that The Secret Doctrine was a final revelation and that naught must be recognised but that book and naught deemed correct but their interpretations of that book. If they are correct, then evolutionary revelation is ended and the plight of humanity is hard indeed.